Swedish welter Patrick Bogere, 11-1, returned to Sweden this week after a training camp at the Floyd Mayweather gym in Las Vegas and was all set for final preparations for his fight November 16 in Linkoeping where he takes on Hungarian Laszlo Fazekas. However, inbetween Bogere will by invitation return to the US on Sunday and this time train with Manny Pacquiao at the Wild Card Gym in Los Angeles. Patrick will return home November 12 and thus get a few days to adjust to the rough weather and the time difference. Manager and trainer Wally Munteanu hints that the fight in Linkoeping might be Patrick´s last in Sweden as the special rules (shorter distances, thicker gloves) for professional boxing makes it impossible to climb up the ladder. 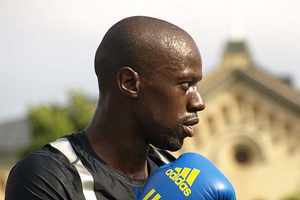 Bogere represented Sweden in 2004 Olympics and turned pro in 2009. He was blatantly robbed against Young Mutley in the UK in 2010 for his sole loss.